Oxymetholone is one of the more potent oral anabolic steroids we have at our disposal; for that matter, it is one of the more potent anabolic steroids we have period, oral or injectable. Commonly referred to as Anadrol Oxymetholone was developed in the 1960s to treat severe anemia and muscle wasting diseases and as such is generally a high quality anabolic steroid for providing massive gains in weight in performance enhancing athletes. While it is very potent it is further very hepatic; a common trait among many oral anabolic steroids. Nevertheless, when it comes to adding pure size this is without its greatest trait but as well see Oxymetholone can serve more than this one purpose. Oxymetholone is further well-suited for providing an even buildup in strength, however this is more of a secondary characteristic as size itself is its primary role. Even so, the steroid does play an important role in both strength and size as it can provide an excellent synergetic effect when coupled with other anabolic steroids in a stack; as it should be, as it is not well-suited to be used alone. While these are the greatest benefits, increases in size and providing steroid synergy, Oxymetholone can be and surprising to many used successfully in a cutting cycle; normally in competitive bodybuilding circles. 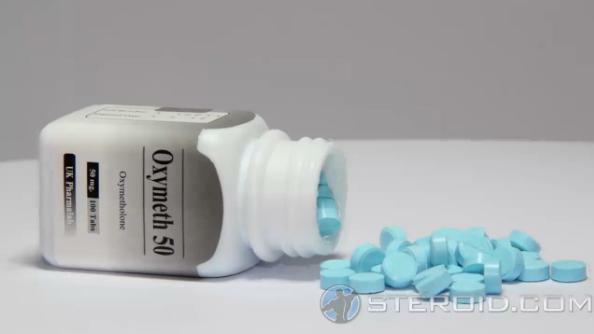 While Oxymetholone is often well-known for promoting water retention it can be largely controlled and many competitive bodybuilders utilize the properties of the steroid in the final weeks of their contest prep in order to give the physique a fuller look as the steroid responds well to carbohydrates and many are often ingested during this phase. It is an important note; those who are sensitive to water retention are advised to stay away from this practice as it will destroy your competitive physique if you dont know exactly how to couple your diet with its use. Like all anabolic steroids Oxymetholone does carry with it possible negative side-effects and they can often be very pronounced, especially regarding water retention. The water buildup can become so great that the pumps associated with training can at times become almost unbearable, especially in the lower-back region. Other common side-effects include high blood pressure, Gynecomastia and acne; although acne is normally not a problem for most and rarely a problem if human grade versions are used. As for all the other effects, water/bloat, Gyno, and high blood pressure, all of these are easily avoidable with the use of an aromatase inhibitor and by following sound nutritional principles. However, those who are naturally prone to high blood pressure may find Oxymetholone to be a poor choice for them regardless of how much caution they implore. Oxymetholone is as mentioned very hepatic and liver enzymes will necessarily increase dramatically with its use. For this reason most Oxymetholone use will generally need to be kept at 6 weeks max with many never needing to go beyond 4 weeks of total use. While this is a very short lived duration its important to note, Oxymetholone appears to be one of the few steroids that really diminishes after use is extended; meaning, even if you went past the 6 week mark you probably wouldnt get much out of it other than damaging your liver. It is comforting to note, while it is toxic to the liver, when used responsibly any toxic effect will be of little concern as the liver will quickly return to normal once use is discontinued. It is important to note, as this steroid is hepatic it does not carry near the level of hepatotoxicity as many over the counter medications and regular alcohol consumption. Like most all anabolic steroids Oxymetholone will suppress your natural testosterone and for this reason testosterone supplementation is very important. However, this is good news as testosterone is one of the purest and most versatile steroids of all, well-tolerated by most all healthy adult men and when conjoined with Oxymetholone it provides one amazing punch.